I guess when you're caught up in the whirlwind of life, 4 years can just fly by like it was nothing. 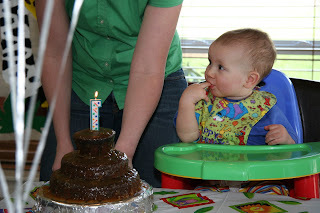 It certainly seems unreal to me that we celebrated Owen's 4th birthday last weekend. I'm sure I'm going to say this every year on his birthday. It's just amazing how quickly it goes by. On the other hand, the idea that there was life before Owen is totally surreal (and ludicrous?). Owen is just an incredible little boy in so many ways. He is loving and sensitive, funny and silly and inquisitive, determined (stubborn?) and ambitious and independent, athletic and creative and dramatic and musical. He is so curious. I am particularly loving his "I wonder" questions these days. A couple of weeks ago he said, "I wonder how the Earth holds itself up? Maybe it has something to do with the moon." Today, after his 4-year-old check-up (which included two shots through which he very bravely sat stiff upper-lipped, determined not to cry) he wanted to know where blood comes from and what it does. Try explaining blood vessels and oxygen transport to a 4-year-old. He very thoughtfully soaks in all kinds of information. Owen is such a great big brother. That is not to say that he doesn't ever do inconsiderate things to Quincy, but the sweet and loving things that he does far outweigh and outnumber the not-so-loving things. I love the way he takes Quincy by the hand and proudly announces to anyone he encounters, "This is my baby brother, Quincy!" And there's no sweeter sound than the two boys cracking each other up until both of them can barely breathe. Owen has many interests, and is so active. He is in basketball, swimming lessons, and soccer, and he takes such pride in any new accomplishment. I love to see the twinkle in his eye when he reports on these accomplishments, like his new personal best number of dribbles at basketball (43), or how many seconds he swam with his face in the water and his legs "mostly straight." Owen has his moments of driving me crazy. I tell him this, and it doesn't seem to bother him, which is fine. However, if he does something that elicits a sharper tongued response, he often cries and says, "I'm crying because I'm sad at myself for doing that." He is so good at verbalizing his emotions. Owen loves his friends, and he is super loyal. He thinks about and talks about his friends all the time. He spends Wednesdays with my mom and his buddy, Joaquin. Owen and Joaquin have such a great time together, and my mom takes them on wonderful adventures to places like the sea lion caves, the zoo in Portland, the children's museum in Salem, basketball class, our own backyard, etc. Now, when we're driving in the car listening to kids music, Owen often tells me, "Skip this song, Mom, because Joaquin loves this song, and we can't listen to it without him. We need to save it." This post really could be endless, so I'm going to wrap it up. I just want to have a record in the future of what Owen was like when he turned 4. I guess I should add some growth stats. We went to the doctor today, and Owen weighs 40.6 pounds and is 41 3/4 inches tall. That makes him 80th percentile for height and 79th for weight, which means he is perfectly proportionate. I'll do a separate post about Owen's birthday celebrations. Ok, I've been avoiding my blog for weeks and weeks now because I didn't want to deal with catching up on everything from Christmas until now. I finally decided that instead of catching up, I will just fast forward. So...my last blog posting was about Owen being a sheep in the Christmas pageant, and here I am 2 months later about to blog about sheep again. That's right, it's lambing season. February means those oh-so-adorable little lambies bounding around the fields. It also means free entertainment for the kids in Corvallis. OSU's sheep research barn is open to the public daily during lambing season. It's a pretty drive out to the lambing barns, which are on the edge of town. There are many pens containing sheep in all stages. Some are full of super pregnant ewes sitting around panting and waiting to give birth (does that hit a little too close to home, Britt?) And others are full of ewes and lambs. There is one random alpaca in one of the pens. Anyway, the lambs are darling, and the kids love to go. Quincy keeps saying, "Go back sheep. Go back sheepies!" Luckily, tomorrow is his day at home with Abuela, and she will take him for his 3rd trip. Here are some pictures from last Sunday's jaunt to see the lambs. Our church decided to resurrect an old tradition of having a Christmas pageant this year. I think they did a great job of incorporating all ages of kids and youth. It was narrated by high schoolers, middle school youth were the principles, elementary school kids were the wise people, townspeople, and shepherds. And preschool-kinder kids were the sheep. This is the category into which Owen fell, and he had so much fun! I'll see if I can get some video posted at some point because it was classic as Owen belted out "Behold That Star" just a little louder and a little ahead of everyone else. Liz, the senior minister, told me afterward, "Owen stole the show." And at church the following Sunday she said with a chuckle, "People are still talking about your son." And to think that I thought there was a possibility that he would decide not to go on stage at all. Anyway, the pageant was great! All of the kids did such a great job! After the pageant, we came home and lit the advent candles and put out treats for Santa. As always, Christmas this year was VERY busy and VERY fun! We were nervous that all the snow in Portland would keep Britt, Pat, Rory, and Madi home. However, they endured a 5 1/2 hour car ride (yes, you read that correctly) from Portland to Corvallis on the 23rd, and we were so happy to have them in town for our traditional Christmas Eve celebration at Grandpa Stan and Grandma Linda's. Madi got the boys this great toy--it's kind of like a giant soft frisbee. Quincy especially loves it! Owen and Quincy opening their trampoline from Grandpa and Grandma! Owen didn't believe that the box contained a trampoline. I love this picture of Rory chillin' on the chair at (almost) the end of presents. Grandpa Stan totally refurbished Britt's old dollhouse for Rory. He spent countless hours on it, and it's BEAUTIFUL! All of the kids were excited about Rory's new dollhouse! It was a really fun afternoon. Thanks Grandma and Grandpa! The Pacific Northwest was hit with some very uncharacteristic weather in the middle of December. Lots and LOTS of snow! Here in Corvallis during the week before Christmas vacation we had school canceled on Monday and Tuesday, had a late start Wednesday, a regular day Thursday, and then school canceled again on Friday. It was such a weird way to head into winter break. After our snow from that Friday disappeared, we just got a lot of rain. Salem, Portland, and points north all got dumped on for several more days. Here are some pics of the boys in the snow. Happy 5th Birthday Jack Weston Harpster!! What's Happening With The Hodgson's?